We have one share to give away for Week 9. This is a picture of what we had last week in the shares. This week should be similar. If you would like to try out our CSA (Community Supported Agricultural Operation) this is your chance. All you have to do is go to our face book page @UrbanFarmAdventures Like our page if you haven’t already, Find the contest post, comment on it and share the contest to your wall for all of your friends to see. We will announce the winner after 8 PM on Wednesday July 27. Winner must pick up on Thursday July 28 between 6 and 8 here at GI Acres. Good Luck, Have Fun, and Share Us with your Friends. Here is what our weekly shares contain. If you see lots of veggies on a table that is the total for 9 shares. If it is just in front of a basket that was one share. 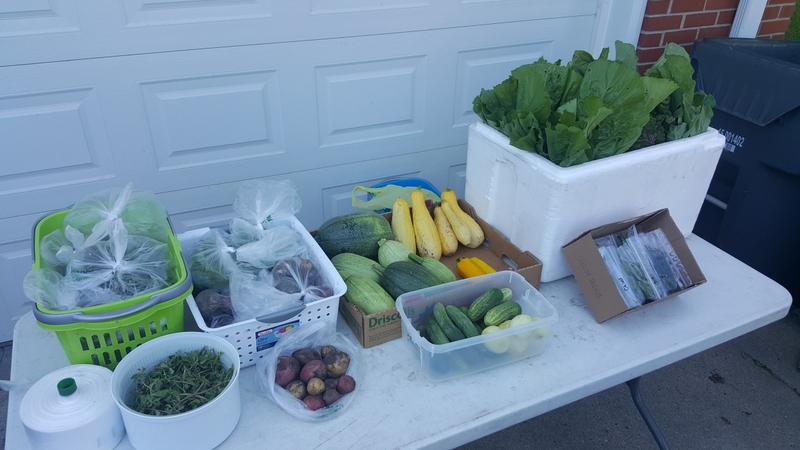 Our goal was to provide at least $10 worth of Farmer’s Market quality fresh product to our members per week. The contents of the shares change every week because different things are ready at different times. 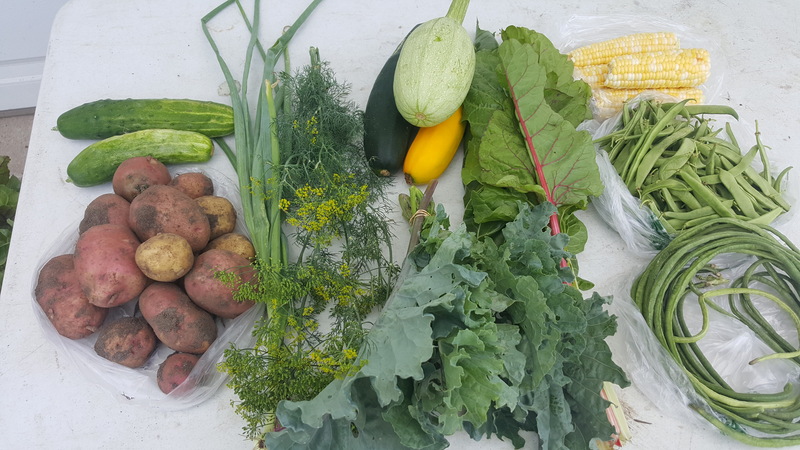 We started with cool season crops like radishes, peas and lettuce and then progress into warm season items like cucumbers, summer squash and green beans. Eventually we will have tomatoes, peppers, corn, and maybe melons. In the fall we hope to offer winter squash, late tomatoes and maybe some of the cools season crops like lettuce and radishes again. Swiss chard has been a killer producer for us this year and I think people are getting tired of it but it sure is pretty and it tastes good. We always send the beets and turnips home with the tops. Our rabbits would love them but the tops cook up really nice for people too.